Mowing a lawn with a pattern can transform a standard and nondescript lawn into something out of the ordinary. Instead of pushing the lawn mower back and forth across the grass, cut diagonal lines on your lawn to give it a special appearance. Creating a mowed pattern takes no more time or effort than standard mowing--you simply adjust the direction and cut the grass. Divide your lawn into separate areas--front yard, back yard and side yards. You will mow each area separately in a diagonal pattern. Mow around the entire perimeter of an area first. Begin in one corner of your first area. Position the lawn mower at a 45-degree angle relative to the corner and push the mower forward until you reach the perimeter area where you already mowed. 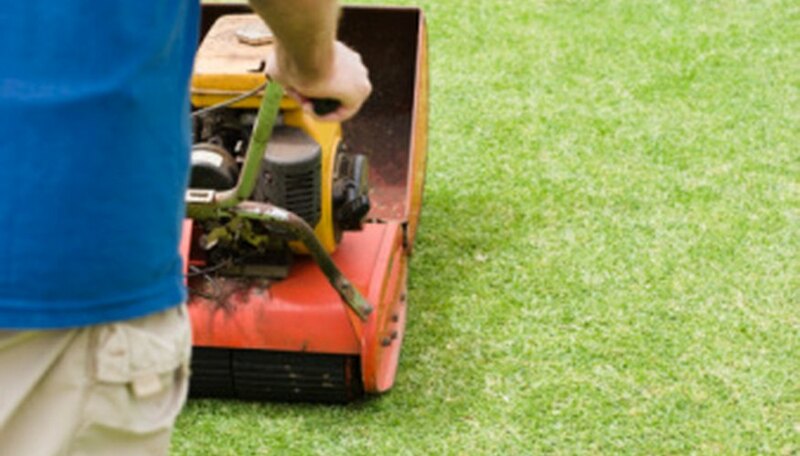 Continue pushing the lawn mower until it advances off the lawn to eliminate stress on the grass. Pivot the lawn mower so it faces the direction from which you just mowed. Position the wheels so you overlap the row you just cut by about 4 inches. Push the lawn mower until you reach the perimeter area again, then push the mower off the lawn to turn it around. Continue mowing back and forth in rows across the area until you reach the opposite corner. Keep your rows straight by watching a point off in the distance as you mow and walking slowly. Mow around the entire perimeter again to remove any turning lines. Mow each separate area of your lawn using the same technique. Try combining different diagonal patterns in the different areas. For example, divide your front yard into two areas on either side of a front sidewalk. Mow the left side of the yard at a left-facing angle away from the walk, and the right side of the yard at a right-facing angle away from the walk. Increase your grass height by about 1/2 inch to make diagonal stripes more noticeable. Vary the direction of the diagonals every week or two to avoid stress on the lawn.